Mattawan Consolidated Schools is a 3,700 student school district in Southwest Michigan. Pulling students from other small villages and towns in the surrounding area, Mattawan Schools offers a rigorous academic experience, while still providing a small town atmosphere for students. Recent improvements in technology and large scale upgrades of both student computers and Internet connection has allowed greater use of Web 2.0 tools. As the technology teacher at Mattawan Later Elementary, Ben Rimes, Technology Teacher and MACUL Board Member, was looking for a way to integrate the Michigan Educational Technology Standards (M.E.T.S) with other standards in the elementary curriculum. "All 5th graders in Michigan are required to experience and show proficiency in online communication and collaboration," explains Ben. "English Language Arts skills also require writing for information, as well as general research skills. All of these skills and standards could be met using a wiki-powered website to create a Kidpedia (an online encyclopedia written by kids, for kids)." The Wiki needed to be advertisement free, able to host up to 300+ users, have a rich-text HTML editor, and provide school staff with a wide range of administration tools to maintain all of the students' accounts in order to keep them accountable for their work. Flexibility of design, and the ability to customize the templates and skins for the Wiki was also a high priority. Choosing the right Wiki site was challenging, as many free sites had education friendly services (no advertisements), but often were lacking in features such as a rich-text editor and the ability to manage accounts effectively. The ability to control certain features of the Wiki such as commenting and alter the appearance of the Wiki were also requirements that many other free Wiki sites just couldn't provide. "After looking through several alternatives such as PBWiki and Wikispaces, I was referred to EditMe by Steve Dembo, Online Community Manager for Discovery Education. Discovery Learning had previous experience using EditMe's services, so I signed up on the demo wiki to see what is was like. I was instantly hooked; not only was the interface simple and pretty, but the editor was intuitive and more powerful than any other wiki-service I had seen. The cost of hosting and subscription was easily covered by one of the grants provided by my district. Once I had secured the funds, it was easy to setup my own custom domain and redirect my EditMe site to it," explains Rimes. EditMe's powerful rich text editor was one of the most important features for Rimes. "I wanted an interface that looked, and acted, like any other office program. EditMe provided all of the usuall buttons, settings, and functions that we use in Open Office Writer at school, and even included easy cut and paste options for moving content directly from a word processor to the wiki." EditMe's suitability to private, secure and unbranded sites was also a key ingredient. "Being able to control every last security setting, as well as having my own wiki site that was unconnected from other EditMe sites, was a huge plus. On many of the other wiki services, students were often confused when they logged in and were taken to a homepage for the entire wiki service, rather than just our wiki. With EditMe, all of the students have accounts just for the Kidpedia, and I have complete control over who can register and how the users interact with the site. That adds a level of protection and control that is often needed in education." Overall, Rimes is happy with the outcome. "I have yet to find any flaws with EditMe, and thus far it's been worth every penny that my school has paid for it. No advertisements, complete control over the user base, and a distinct site that's clearly our own has made using EditMe a worry free experience in my computer lab." 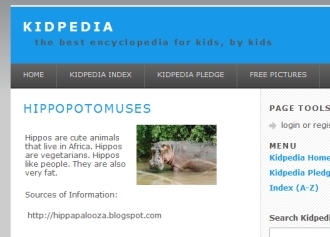 With over two hundred registered fifth graders submitting content, Kidpedia promises to grow quickly and help to foster the next generation of wiki contributors. "With EditMe, all of the students have accounts just for the Kidpedia, and I have complete control over who can register and how the users interact with the site. That adds a level of protection and control that is often needed in education." An editor as easy to use as a familiar word processing application. Access controls and user management tools. A private wiki that isn't mixed into a larger wiki service. EditMe's powerful rich text editor looks similar to Open Office Writer and other popular word processing tools. EditMe sites never have advertising, unless the customer puts it there. EditMe's access controls are unparalleled among wiki tools. EditMe sites are not automatically mixed into a larger community of sites and account logins are handled at the individual site level.